www.officer.com January 2016 Law Enforcement Technology 31 the magazine, Rack the slide smartly, and Re-engage (or reassess) the target. How many magazines should you have? If your handgun uses standard capacity (more than 10 round) maga- zines, then you should have a minimum of two additional magazines on the belt. This will give the officer 36 to 45 rounds on the belt. There should be at least five more reloads in the patrol bag for a total of 60 to 75 rounds. If your duty gun is an M1911 variant, four on the belt and ten in the bag. Magazine capacity should never be a factor when looking at a duty gun (or creating legislation for that matter). The one that fits the hand and launches bullets accurately and reliably trumps everything. Check your magazines first An officer with whom I occasionally trained had purchased a new custom .45 he was going to swear in for duty. I was familiar with this model and knew of its outstanding quality. It didn't come with enough magazines for anyone's taste, so the proud new owner went to a local gun store and bought some. It was a tack driver. However, several times that day it failed to feed. By the second box of .45s he was using choice words to describe his gun. He started boxing it up, saying that it was going back to the gunsmith imme- diately. I told him to check his magazines first, but we were beyond negotiation. Like most manufacturers, they asked for the gun and the magazines used, accompanied by a description of the problem. When the gun arrived six weeks later it came with duct tape wrapped around two of the magazines (the cheap ones from the gun store). The Sharpie instructions on the tape said, "Do not use these magazines". Like I said, check your magazines first. 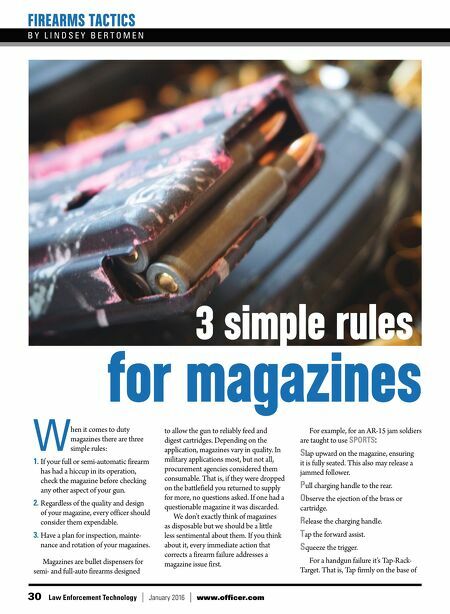 Magazine failure isn't immediately apparent, but there are only a couple of things that cause failure: Bullets either come out when they're not needed or bullets don't come out when they are needed. For the first part of the inspec- tion, remove all cartridges and look at the outside for cracks, dents and corro- sion. Line 'em all up empty and look for anomalies. 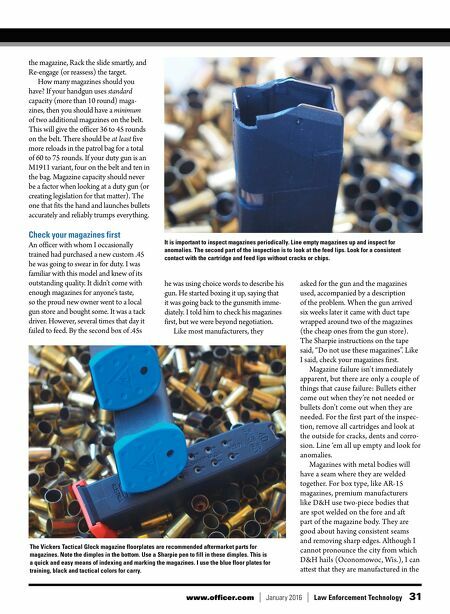 Magazines with metal bodies will have a seam where they are welded together. For box type, like AR-15 magazines, premium manufacturers like D&H use two-piece bodies that are spot welded on the fore and aft part of the magazine body. They are good about having consistent seams and removing sharp edges. Although I cannot pronounce the city from which D&H hails (Oconomowoc, Wis.), I can attest that they are manufactured in the The Vickers Tactical Glock magazine floorplates are recommended aftermarket parts for magazines. Note the dimples in the bottom. Use a Sharpie pen to fill in these dimples. This is a quick and easy means of indexing and marking the magazines. I use the blue floor plates for training, black and tactical colors for carry. It is important to inspect magazines periodically. Line empty magazines up and inspect for anomalies. The second part of the inspection is to look at the feed lips. Look for a consistent contact with the cartridge and feed lips without cracks or chips.